Edited 7 time(s). Last edit at 2013-05-08 23:16 by Green Lady. Thank you Green Lady, you deserve your own Stones jersey for all the hard work you've put in to help keep this site organized. Edited 1 time(s). Last edit at 2013-05-06 15:15 by MoreFastNumbers. Thanks for posting the videos. They gave me a good idea of where the Stones are these days as a band. Alas, for me, band isn't the word to use here. "Brand" is a much better word choice. They remind me of what I thought the few times I saw Eric Clapton: Great musical chops, but no fire or dynamic to the music or show. The clip of Little Red Rooster is sad. It's done as a basic blues song with a paint by numbers arrangement making the Stones sound like just another Vegas bar band. Tom Waits is embarassing and looks as if he is trying to appear as a caricature of himself and or some old blues guy mugging it up for the camera. And, now that I think about, just what in the hell does Tom Waits have to do with anything regarding the Stones? Was no one else available? Anyway, enough carping. Again, thanks for posting the videos and please continue to do so. Y'all are saving me the cost of a ticket, parking, concessions, a t-shirt and a long line to use the bathroom. this is amazing ive seen almost 2 complete shows on youtube and able to leave out the warhorses! thanks man! Anyone have a video of Live With Me? Max, this was your idea - do you want to do some? Or anyone else? But you do such a good job GL. I like your format.... the set list pic and your other touches. As long as you want to be in charge, I nominate you.... but when you grow weary I hope who ever takes over keep the same format. I am happy to do it, or whom ever wants to good job with it.... or maybe even bv wants to decide who is best. The main thing needed is diligent people searching for the best Youtube videos of the songs, maybe we should formalize a team who are happy/want to help, and really apply themselves each show to continue looking for video until the list if "good enough". Anybody can do it....as long as there are people doing it... versus people assumimng others are doing it, when really just one is looking. Just some ideas... it should be a team effort. Well, it is a team effort, and there are some great YouTube big game hunters out there, whose efforts I steal shamelessly. For some reason Oakland seems to be slower appearing than Staples was, but they are showing up now. I do enjoy doing these, but as you say, it does need a fair bit of work to sort out the good videos , and with the shows fairly close together the new one comes along while there is still good stuff appearing for the earlier one, and confusion sets in (I managed to post several clips for the wrong O2 show last year). Well hopefully someone will step up and keep the consistant format, but if no one does, I will do it/more/again, but I think might be better if someone else does it, because although this was my idea to start with, it is now an IORR board concept. SO anybody who likes these threads and wants to rotate help building them... sign on up today... and lets rotate who does them.... or what ever people think will work best for the board. Edit - Apparently I forgot how to read and posted this in the wrong section. MY BAD! Edited 2 time(s). Last edit at 2013-05-07 09:05 by flacnvinyl. BTW, you guys are spot on about this being a community venture. HP Pavilion, San Jose, May 8th 2013 - the show in videos thread. edit your first post over and over until it is "done". Or of course what you think works better... it is up to you. Edited 2 time(s). Last edit at 2013-05-07 09:16 by Max'sKansasCity. Fixed my post. BTW there are some great audience recordings turning up already! Since I am about to move my studio I don't think I can volunteer for the next round, yet, but I can always search every morning as I do and post any videos that don't appear in the list! 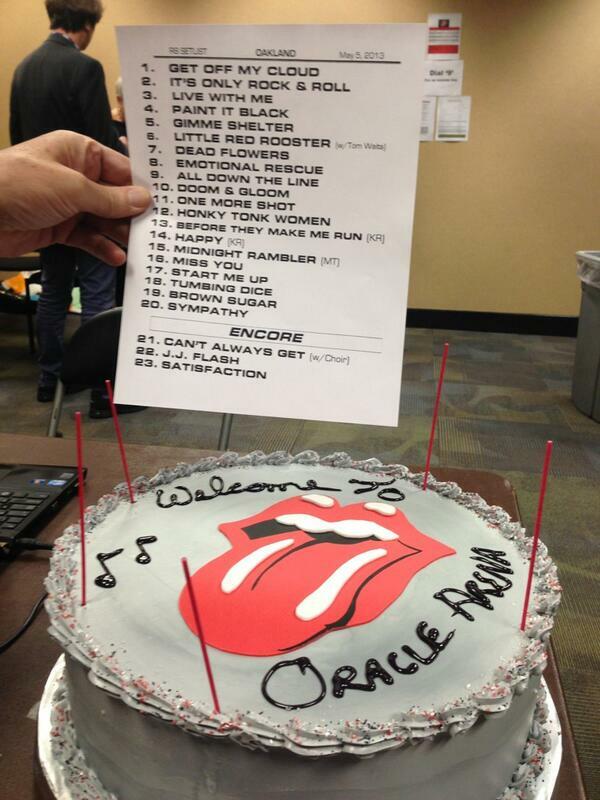 It's Only Rock'n'Roll Oakland 5/5/2013 -- Thanks to drbryant. Edited 2 time(s). Last edit at 2013-05-07 13:30 by Irix. Which is a shame really because he pretty much nailed the rest. Edited 1 time(s). Last edit at 2013-05-07 13:36 by GravityBoy. Looks like not much support or interest from IORR memebers to continue these threads... fine by me, if people are not interested in taking turns running the threads..... then oh well. Doesn't look like a lot of videos so far for Oakland, either. Doesn't anybody like Live With Me? OOOPS - hasty edit to include the video found by Lien! Thank you. Edited 1 time(s). Last edit at 2013-05-07 21:44 by Green Lady. Unfortunately I'm in a hurry the whole week but I think I could do the Videos-Thread for both Anaheim shows if you agree. Edited 1 time(s). Last edit at 2013-05-08 10:20 by maradona. Thanks for BTMMR and the Tongue Pit view of GOOMC. Hey Green lady thank you very much for your hard word. The "Start Me Up" video has BV high fiving Mick. I am sure he must be delighted that you caught it on tape!! Great vid of JJF focusing on Keith. Same user has uploaded some other songs too.